The route begins on AR 90 west just north of Pocahontas, near the Black River and Eleven Point River. 3.5 miles to the northwest of town, the route heads west on Blacks Ferry Rd. into a peaceful farm valley. Just after crossing the river, the road becomes Valley Chapel Rd. and continues on the old Valley Chapel Church. The road bends to the north, passes the church and intersects Hall Rd. which leads us farther north up the mountain where it intersects AR 90. From there head west to Ravenden Springs to the intersection at Upper Janes Creek Rd. The route turns west on Upper Janes Creek Rd. and follows the valley north into the mountains where it once again leaves the pavement for crunchy terrain. Follow Upper Janes Creek Rd. as it winds through the forest to the intersection of Taylor Rd. A short detour takes you back to Upper Janes Creek Rd. Continue west toward the town of Wirth. From there, follow Wirth Rd. between the mountaintop meadows to Busch Run Rd. Once again on pavement, ride west on Busch Run to US 63 and north toward Mammoth Spring, a town named for Arkansas’s largest spring, a National Natural Landmark. From downtown Mammoth Spring, turn south on Second Street from AR 9. Veer right onto Riverview Rd. then turn left onto north Fairview Rd. Follow Fairview south out of town as it winds through the mountains to the intersection with Bayou Access Rd. Be prepared to cross several small creeks as you continue south toward English Creek Rd. Continue south all the way to Baker’s Ford which takes you to Nine Mile Rd. where you’ll head east to the Spring River, a beautiful stream for its crystal-clear waters lined by rocky bluffs. Crossing the long, one-lane bridge the road changes names to Bluff Rd. but continues toward US 63, just north of Hardy. Take US 63 south into Hardy where you’ll cross back over the Spring River on US 412 west. Shortly after crossing, the route turns right onto AR 342 for a scenic jaunt along the Spring River bottoms. Ar 342 gives way to Rock Creek Rd. and continues south into the Wildlife Management Area with opportunities for viewing a variety of wildlife. Rock Creek ends at AR 58, but continues south on Mill Creek Rd., just across its highway follow Mill Creek Rd. along the hollow to its intersection with Strawberry Rd. where the ride heads east to Smithville. Just east of here on AR 117, turn south on Lawrence County Rd. 273 toward Hardaway. From CR 273, turn east on CR 280, then south on CR 281, then back east on CR 279 into Lynn. In Lynn, head south on AR 361 to Game and Fish Rd. (CR 316) and ride east into the Shirey Bay Wildlife Management Area. As you cross the cypress bottoms of Shirey Bay, continue east on CR 317 and follow the Black River north to CR 309. Turn east on CR 309, and ride north to CR 301. Turn east onto CR 301, follow it north to Powhatan Historic State Park where your 113-mile route ends. The rugged Ozark National Forest surrounds you on this dual-sport route between Calico Rock and Prim near Greers Ferry Lake. Begin in Big Flat on Endless Road/CR 145 and ride north into the Leatherwood Wilderness Area to Root (or Rand) Road/CR 146. Here you will head back east to AR 341, Push Mountain Road. Pound the pavement through the extreme curves of Push Mountain Road to CR 74, then head east into the Sylamore WMA. The route connects with CR 75 south. Take Gunner Pool Road northeast for a short bit then head east onto Bear Road/CR 26. Continue to Sandy Flat Road/CR 25 for a winding ride south to Green Mountain Road/CR 72 Turn east, and Green Mountain Road takes you down the mountain to AR 5. Turn south to meet up with the White River at Allison. The route makes a turn back to the west on AR 14 for another curvy section of asphalt all the way to the city of Fifty-Six, home to Blanchard Springs Caverns, a must-see site along this route. The ride heads south on Mitchell Road/CR 81, which gives way to the east end of oak Grove Loop, just before you meet up with AR 66 for another turn to the west. Follow AR 66 to AR 263 just west of Timbo. Heading south on AR 263 to the top of the mountain, the route turns east onto CR 16 and follows Sunny Fox Road all the way to AR 9. Turn south on AR 9, then a quick turn to the east on Sunnyland Road/CR206 and follow it to Racket Ridge Road/CR 200 near the Cherokee WMA. Racket Ridge will take the route east to Hanover Road/CR21 where you head south toward AR 263 and to the town of Prim. In Prim, discover Longbow Resort, a unique Ozark Getaway with cabins built into massive rock formations, alongside streams and amid undisturbed natural beauty. Turn south on AR 263 and cross over the Devil’s Fork of the Little Red River where our route ends at AR 92. This route takes you about six hours to complete. From Mountain View, warm up by leisurely traveling north on AR 5 along the Sylamore Scenic Byway and cross the White River Bridge to Calico Rock. Places of interest include the Calico Rock Museum, a local art gallery and Printing Press Café in the downtown area. Continue on AR 5 to Norfork to view the Jacob Wolf House. Built in 1829, it was the first courthouse for Izard County in the Arkansas Territory and is the oldest public structure in the state from this area. The route west on AR 5 is nice but grows more urban as it nears Mountain Home, the hub of a thriving resort and retirement area. The traffic in Mountain Home is light and easily managed. Follow AR 5 through downtown, then pick up AR 178 outside of town. Head south through Lakeview to the Bull Shoals Dam and Bull Shoals/White River State Park. The park Visitor Center is a great place to stop, take in the scenery and stretch your legs. Heading south on AR 178, the ride becomes a pleasant cruise through rural landscapes. Just south of Flippin you will turn right and head west on Hwy 412 all the way to Yellville. Easy, broad sweepers make it a fun but not overly stressful run. In Yellville turn right on AR 14 and begin your cruise south. The curves are tight enough to be fun but not overwhelming. The scenery is exceptionally lush, and the highway’s intersection with the Buffalo National River adds to its appeal. So, be sure to take the short ride trip on AR 268 to Buffalo Point Park. AR 14 later crosses the scenic Buffalo National River. Bear left and keep following AR 14 at Harriet. The eight-mile section of AR 14 between Harriet and the AR 263 junction is a picturesque winding road. Take a right at AR 263 and ride some tight curves through farmland and woods. 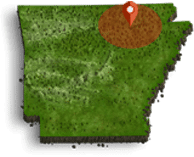 In Timbo, the birthplace of folk music legend Jimmy Driftwood, take a left on AR 66 and head back into Mountain View.This route will definitely scratch the itch motorcyclists have for either sport riding or scenic cruising. Begin the Ozark Glide in beautiful Mammoth Spring Arkansas, a town named for Arkansas’s largest spring, a National Natural Landmark. Follow Highway 9 south to the small town of Salem. Take time to visit their downtown area and their City Park. From Salem head south to highway 56 and veer left onto the Highway. Follow this beautiful ride to Ash Flat where you will take a left onto highway 167. Be sure to stop by the Ash Flat Veterans Memorial on your ride. Head north on 167 towards Cherokee Village and Hardy. Take a short ride into Cherokee Village where you can enjoy their lakes and downtown area. In Hardy you will find unique shops as well as places to eat, lodge and even rent a canoe! From Hardy travel on highway 412 back to Mammoth Spring where you ride ends. 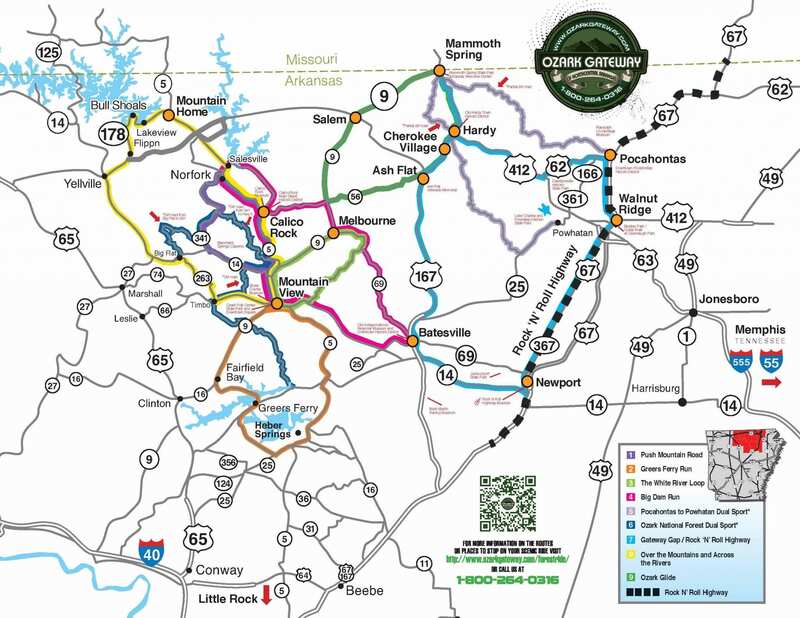 For information on the Arkansas Ozark Mountains, call 1-800-264-0316 or visit arkansas.com for more motorcycle and visitor information on the region and state.